Hannah Payne’s life has been devoted to church and family, but after her arrest, she awakens to a nightmare: she is lying on a table in a bare room, covered only by a paper gown, with cameras broadcasting her every move to millions at home, for whom observing new Chromes—criminals whose skin color has been genetically altered to match the class of their crime—is a new and sinister form of entertainment. Hannah is a Red; her crime is murder. The victim, according to the State of Texas, was her unborn child, and Hannah is determined to protect the identity of the father, a public figure with whom she’s shared a fierce and forbidden love. 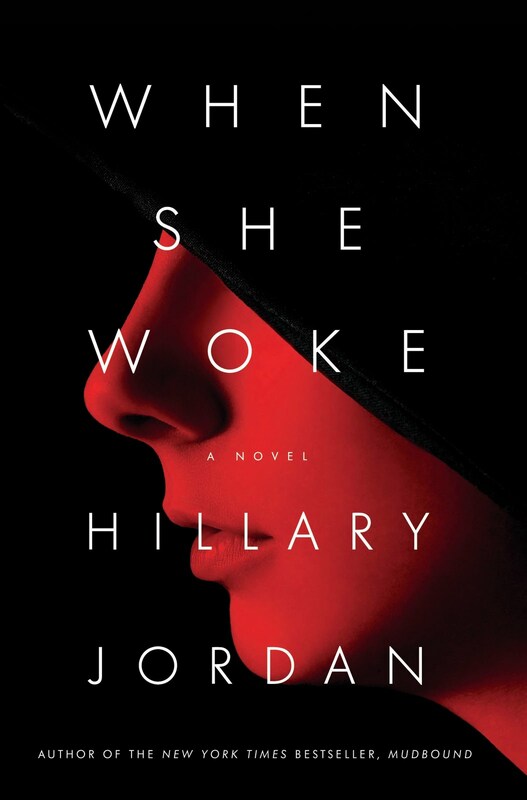 When She Woke is basically a futuristic version of The Scarlett Letter, with The Handmaid’s Tale (and perhaps some other dystopian novels) mixed in. I’m not sure if the Atwood connection was purposeful (that connection is more in the backstory of this dystopia), but it is exceedingly clear that the author intended the parallels to The Scarlett Letter—ex. with the names (Hannah Payne, Reverend Dale, etc), and Hannah’s unwillingness to identify the father of her child. By later on in the story, plot of When She Woke did diverge to an extent from The Scarlett Letter, which I was glad for, having spent a bit too much time early on comparing the two novels. I enjoyed the plot of this novel, and it was clear that Jordan put in a lot of effort to make everything make sense (the color changing, the things Hannah does, etc.). It would have been easy for this novel to spin off into fantasy, but Jordan kept it pretty well-grounded. The only thing I could have used was more backstory as to how the US politics switched entirely to fundamentalist Christianity—while Hawthorne’s novel was based on Puritan New England, Jordan’s novel derives from the US in its current state, which I guess is kind of in flux religiously. It would have been interesting to know how much of Jordan’s US population actually believed in and agreed with the Sanctity of Life laws and the melachroming, particularly since something like a quarter of the US isn’t Christian, and since our politics have spent most of the US’s lifetime switching back and forth between liberal and conservative. I also had trouble figuring out when this takes place—at times, it seems like it’s only maybe 10 years into the future, but at other times it could be 30 or even 50 years in the future; Jordan doesn’t focus very much on technology, and instead will occasionally throw in references to things like “servbots” or “netlets,” leaving it up to the reader to figure out what they are. As far as characters go, Hannah can get kind of annoying, but I found her struggles interesting. Though I had a hard time relating to them, I did feel like I understood why she felt the way she felt, even if I thought she or her thoughts or actions were stupid or naïve at times. The secondary characters in the novel were generally pretty secondary, but Jordan goes into just enough detail about them that I had an understanding of who they were and what their roles were. I loved Kayla in particular, who is funny and witty and balances out the annoying aspects of Hannah. As a note, while there is a ton of focus on religion in When She Woke, I definitely wouldn’t describe it as “Christian literature.” It doesn’t preach, rather it presents the conflicts that arise with extreme religion and extreme conformity—essentially, it is a dystopia where the dystopian aspects happen to focus on religion. There is a lot of moral conflict in this novel, but there are also a lot of extremes—too many extremes, in my opinion. Hannah’s fundamentalist life is a bit over the top, with a complete lack of women’s rights and a severe patriarchy. It became a bit unrealistic. While this novel isn’t amazing, it is the kind that really transports you into another world. I read for hours not noticing the time, completely caught up in Hannah’s world and her adventures. Jordan does a great job at weaving together Hannah’s past and present. She does at times seem to try a little too hard to create a novel deeper than this one could be, and it could have used better editing (I saw at least a few typos) but overall, I thought that When She Woke was an interesting and worthwhile read. I really like the novel but I have to admit at times it made me incredibly frustrated. Like you I sometimes found Hannah annoying. I realize that she was in a difficult situation but I would cringe sometimes when she talked about the Rev. Dale. It seemed she loved him more than she loved herself and it drove me crazy! Wow - this sounds so interesting. I'll have to check it out. Thanks for the great review. Great review. I don't think I've seen a negative review of this one yet, and given that I appreciated both The Scarlet Letter and the Handmaid's Tale, this one sounds right up my alley.